Initially I was disappointed that this book was not about Tarver and Lilac from These Broken Stars. I had not read anything about it when I picked it up, I just knew that it was the second book and was eager to find out what was going on with them after the first book. However, finishing this book made These Broken Stars even BETTER than I thought it was when I finished it. I liken it to chocolate and peanut butter. Two things very good on their own, but combined make something amazing. 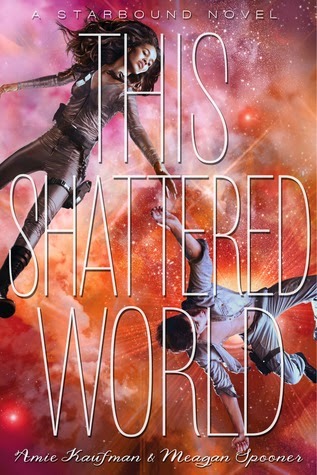 This Shattered World is the story of Captain Jubilee Lee, a legend of sorts on the planet Avon, and Flynn Cormac, a rebel leader. Flynn is fighting for the rights and lives of his people. An oppressed bunch, living in caves without technology, medicine, access to proper education and food. Jubilee is part of the military stationed on Avon to keep the rebels in check during the ongoing war. What Flynn really wants to know though, and what he is fighting for, is why his home planet isn't growing or getting better. The corporations that terraform planets around the universe, make them habitable, aren't fulfilling their promises to get Avon up to livable standards and he wants to know why. So he does the only thing he can think of when he and Lee cross paths. He manages to take their Legend warrior hostage in hopes of bartering her life for goods and answers. What follows is the story of two enemies that have to make serious decisions that will make them outcasts to their own people. When I started reading this I didn't understand how the two stories connected. They were so different and there seemed to be no overlap except for the fact that Tarver had mentioned Avon in These Broken Stars. However, Tarver and Lilac eventually do find their way into the story and suddenly the readers rewards for reading the first book are all over the place. Things start clicking into place and the magnitude of what Tarver and Lilac discovered in the first book blows wide open. The authors of this series are brilliant. They don't make things blatantly obvious. They trust the readers to remember and to know, which I love. It makes putting the pieces together in your head that much more a satisfying victory. Tarver, Lilac, Flynn, and Jubilee are four complex and interesting characters and the secrets they unveil in This Shattered World are full of sorrow, pain, and downright creepy. While the mystery and the story are becoming much clearer—the magnitude everything really starting to become clear—there is still so much to go, and you just know that the third book in this series is going to be huge. I have no doubt in my mind that the authors will do the series finale complete justice. I know that they will weave the third book into this series seamlessly, the way they did the first two. Definitely a must read series. I chose the Blue Virgin Margarita for this book because Flynn and Jubilee's first interaction is small talk about blue drinks. Jubilee prefers not to drink alcohol too much because she can't act as quickly as she needs to when she is under the influence. Add some fruit skewered on a small pink plastic cocktail sword, and you might as well be ready to join Flynn and Jubilee at the bar.